Ok, my friends, gather 'round. It's time to talk comfort food. I think it's safe to say that we all have those moments when we crave a big food hug and I want to know, what do you reach for? Are you the kind of person who releases a huge sigh when you sink your teeth into chocolate or do your tastebuds yell out for something crunchy and salty? Or do you, like me, hold out for ooey gooey warm and cheesy? Comfort food isn't associated with healthy eating choices as a matter of fact so, before I go on, let me say that contrary to the topic of this post – and the several last few recipes for that matter – I really have been making it a point to eat a little healthier this year. I'm not following any particular diet. I've found that when I go on a "diet" they are so restrictive that I'll do well for a few weeks then fall of the wagon. Like, way, way, way off in another country off. The reality is that fad and highly restrictive diets are not sustainable for me. Instead, I've opted to make subtle changes in my weekday meal choices, embracing a more "mindful eating" approach over blindly filling up with bulk and empty calories. Though this way is slow and steady, the scale and my often needing-to-be-pulled-up pants are starting to reflect these changes. My mindful eating approach is making some appearances here on 'Confessions.' Exhibit A is last week's doughnut post that had us saving some calories because they were baked and not fried. Still an indulgence, of course, but a healthier choice, right? (Just agree with me here, it helps curb the guilt.) And today's post has a few choices that lightened up what traditionally can be a rather heavy dish. 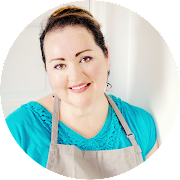 This mindful eating approach includes choosing better ingredients all around and keeping everything in moderation coupled with movement, as in getting off my tush and moving. That part, I confess, I'm still working on. Back to comfort food. When do you crave it most? For me, it's when life decides to act as if it were one huge roller coaster. That's what the last few weeks have been like for me. First the high: The news mill I work for took 15 awards at the Best of News Design Creative Competition, 35th Edition. This juried international competition is sponsored by the Society of News Design and the S.I. Newhouse School of Public Communications at Syracuse University and recognizes excellence in news design, graphics and photography. The personal high for me here is that 6 of those awards were mine and a 7th was a staff award for a series that included two of my covers. Cloud 9 over here. Alas! It was short lived. We recently got word that the news mill is restructuring: some senior management was let go; the TV component of our organization has been shut down, leaving at least half of the TV staff with pink slips; 6 print journalists where also released, including two good friends. Much like newsrooms across the country, our staff has been reduced by half over the last six years or so. Depressing. I say the situation calls for comfort food. Ooey. Gooey. Hot. Melty. Cheesy. 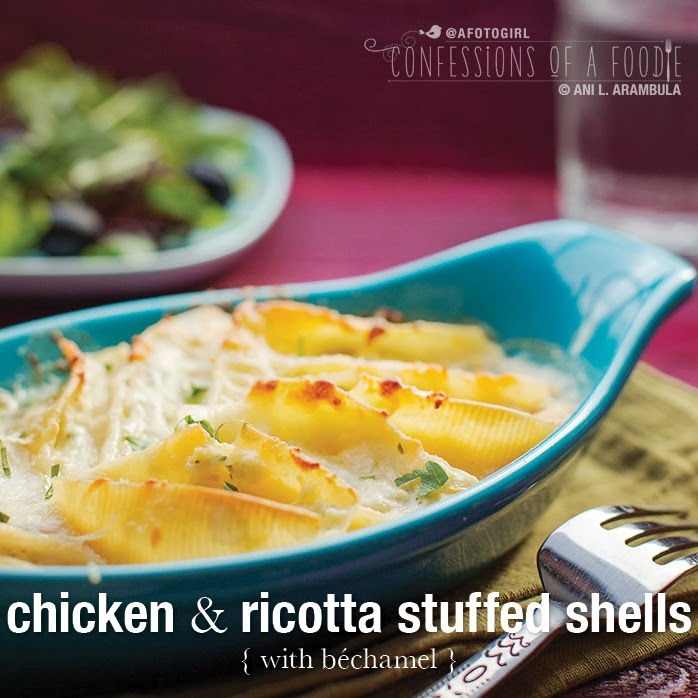 Enter Chicken & Ricotta Stuffed Pasta Shells with Béchamel. 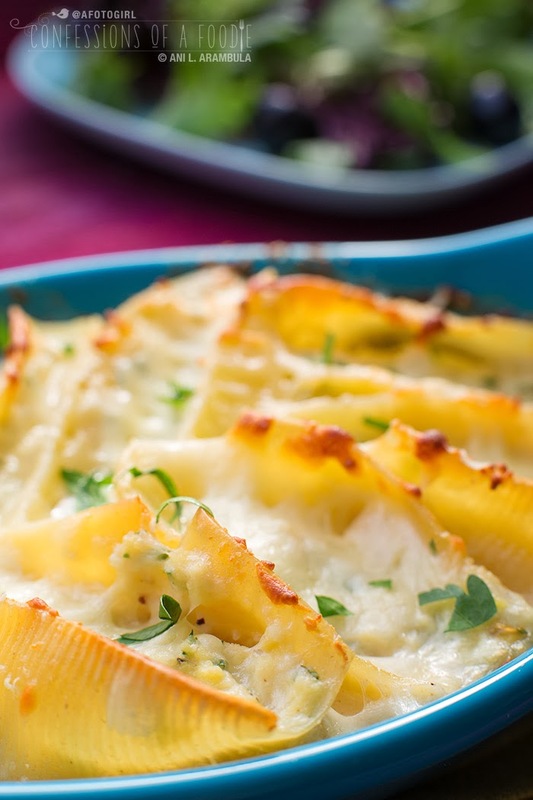 This version of stuffed shells has all the qualities I look for in comfort food: warm, cheesy, with a little crunch. I made a few ingredient choices that helped lighten this up without sacrificing it's comfort food qualities.This meal satisfied me without making me feel like I needed a nap afterwards. The big, heavy, drowning in too much thick sweet tomato sauce overly stuffed shells of dense ricotta served at my local family run Italian hangout always leaves me in a bit of a food coma. My take on this classic did not, especially since I paired it with a good sized salad of fresh baby greens lightly dressed in apple cider vinegar, salt, pepper and a light drizzle of good quality olive oil. First up, the shells themselves. 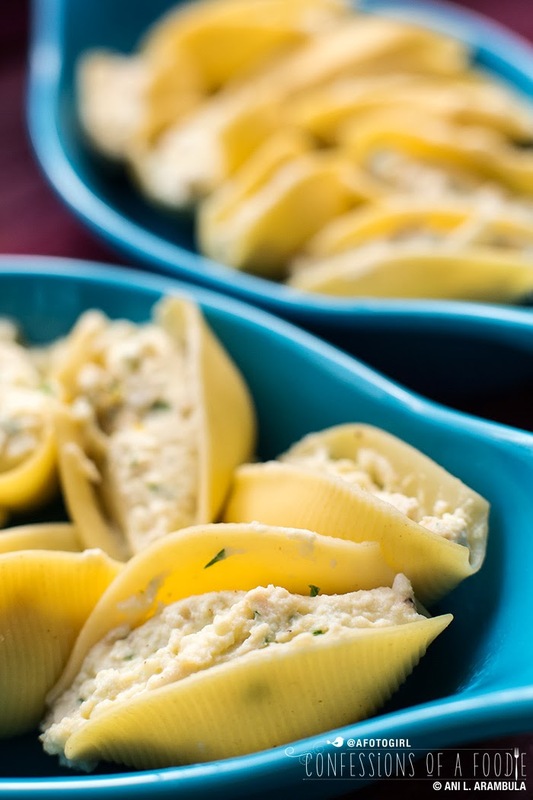 Have you tried stuffing shells, making them according to the recipe on the box, only to be totally frustrated to find when you're draining the pasta that half the shells have torn or are on the verge and as soon as you go to stuff them, they completely fall apart? Or maybe they are salvageable enough but once they're stuffed and baked they are simply mush? Yeah, I've been there and I've felt that frustration. But years of trail and error has me making perfectly intact shells. My trick? Bring the water to a hard rolling boil, then heavily salt, add the shells and set the kitchen timer for exactly 4 minutes and not the 10 to 12 minutes that most package directions indicate to cook them for. You don't want them fully cooked. In fact, you don't even want them al dente. What you are looking for is a shell that is just pliable enough to gently pry open, fill and coax partially closed. For all intent and purposes, the shells are still quite raw. But that's OK because they will finish cooking in the oven, soaking up what ever sauce you're using and in the process, becoming even tastier. The shells will be al dente to tender and not mushy at all. Second, the stuffing: I went with poached free-range chicken breast and part skim ricotta mixed with plenty of fresh flat leaf parsley, freshly grated parmesan, a free range organic egg and salt and pepper. The surprise here? I added the zest of half a lemon which completely brightened the stuffing, making it seem even lighter. Instead of a heavy, thick, slightly sweet tomato sauce, I opted for béchamel sauce. What is that, you ask? Well, like a classic tomato sauce, béchamel is one of the five "mother sauces" in traditional classical cooking. Béchamel is the easiest to make. At it's simplest, it's butter, flour and milk. Mother sauces are called such because they are the head of a second tier of sauces. Once you master the mother, you can make additions to each to turn it into one of a number of sauces within each family. The béchamel here was made with 2% milk in place of the traditional whole milk and I used good quality European-style butter. I also didn't add the onion and garlic or let it reduce by half to thicken because I didn't want a heavy sauce. My auntie commented that it was a really light Béchamel with a lot of flavor which is exactly what I was hoping for. I topped it off with a layer of shredded part skim mozzarella that I knew would brown up nicely on one side and provide the ooey gooey factor on the other. Did this fix my comfort food crave? You bet. Did it leave me in a food coma? Far from it! Give it a whirl the next time you want a great big food hug. I hope you enjoy it as much as my family and I do. I opted to bake these in individual mini casserole dishes as a photo styling choice. If you have individual dishes, feel free to use in place of a lasagna pan as called for in my recipe below. Tear two good sized pieces of plastic wrap or one large one and fold it over. Put chicken breast between plastic and pound out so that the thickest part of the breast is the same thickness as the thinnest part; this will insure the chicken cooks evenly. Place the chicken in a skillet and add water to cover. Drop in the smashed garlic, bay leaf, salt and pepper. Turn heat on high and bring to a rolling boil, reduce heat to medium / medium-low to maintain a good simmer. Cover and let cook for 8 minutes. When time is up, turn heat off, do not lift lead and allow the chicken to poach for 20 minutes. Fill a large stock pot with at least 4 quarts of water and place on stove, turn heat to high, cover and bring to a rolling boil. Once boiling, add salt then carefully drop in the shells. Bring to a boil, then reduce heat to medium and cook for no more than 4 minutes. At the 3 ½ minute mark, using a slotted spoon, begin removing shells to a paper towel lined rimmed baking sheet; set shells aside. Remove the cooked chicken breast to a chopping board or mat and allow to cool enough to handle. Using a sharp chef's knife, cut the chicken into thin strips, then mince and set aside. 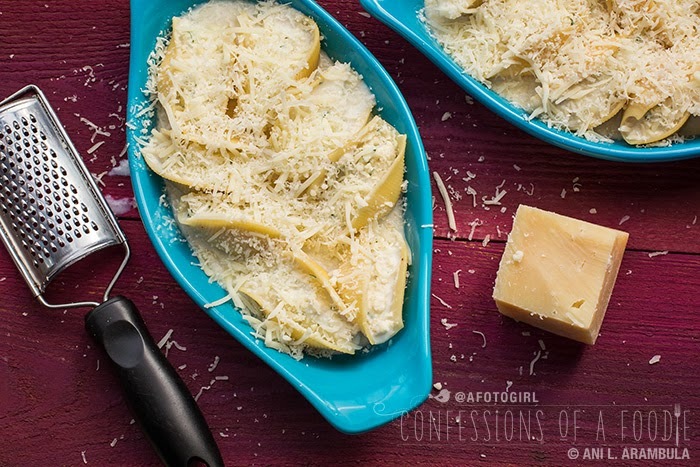 Empty the container of cheese to a large mixing bowl. Toss in the shredded mozzarella, grated parmesan, chopped parsley, lemon zest, and the minced chicken. Stir to combine well. Sprinkle in the salt and freshly ground black pepper to taste (taste now before adding the raw egg). Once satisfied with seasoning, incorporate the lightly beaten egg. Prepare a 9x13 inch lasagna pan by spraying it with cooking oil or rubbing the bottom and sides with butter or olive oil. Arrange lasagna pan, baking sheet with par-boiled shells and the cheese mixture within easy reach. 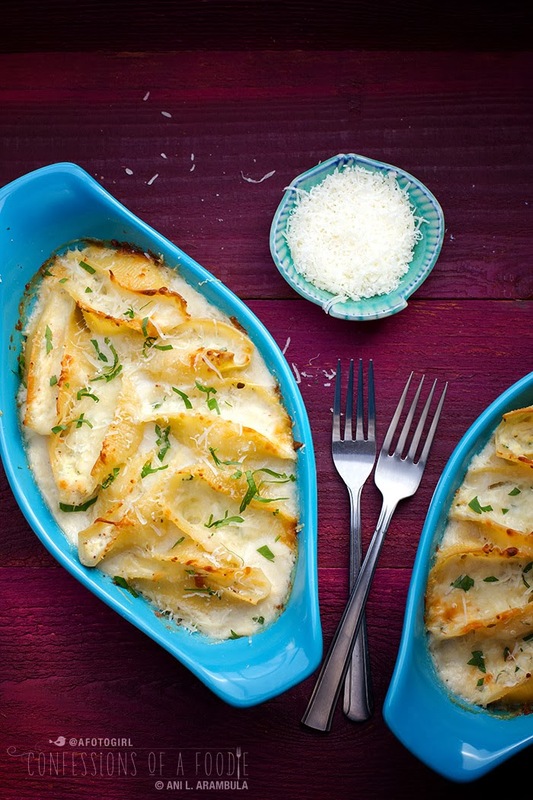 Pick up one shell and gently pry it open halfway, then fill with one rounded tablespoon of the cheese mixture. Gently squeeze the shell closed, place in casserole dish and repeat with remaining shells. Preheat oven to 350 degrees Fahrenheit. Move rack to center of oven. To make the béchamel, add the milk to a saucepan and bring to a low simmer, taking care not to let it boil; turn off heat. Place a second saucepan on medium high heat and add the butter. Once the butter has become frothy, add the flour one tablespoon at a time and whisk well to incorporate after each addition. Cook for 2 minutes or so, whisking continuously until you get a smooth yellow paste; this paste is called roux. Pour in one ladleful of the warmed milk, whisking to keep lumps from forming. Whisk until smooth and continue ladling in milk and whisking to work out any lumps. Once all the milk has been incorporated, add in about ⅛ to ¼ of a teaspoon of freshly grated nutmeg; whisk to incorporate. Add salt and pepper to taste (start with a pinch of salt and one or two grinds of pepper and go from there). Carefully pour the béchamel into the pan with the stuffed shells. Evenly sprinkle the tops of the shells with the second ½ cup of shredded mozzarella. Loosely cover pan with foil and place it on the middle rack of the oven. Bake for 15 minutes. Carefully remove foil from pan and bake for an additional 10 minutes or until the shells are tender and the tops are golden. Allow to cool in pan for 10 minutes before serving. Serve with a simply dressed salad of baby greens or wild rocket. Pairs nicely with a glass of Pinot Grigio. Your turn: What's your idea of comfort food? Do you have a favorite dish? I'd love to know!